The party on Saturday night at The Week with DJs Offer Nissim and Peter Rauhofer was certainly THE event to go to this past weekend in São Paulo. As tired as I was, I went to check it out and almost lasted until Rauhofer took over the turntables early in the morning. I don't think I had ever seen the club as crowded as it was. 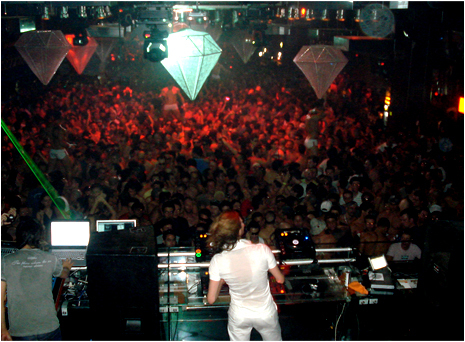 When Offer Nissim took the stage, the boys on the dancefloor went absolutely insane. I captured most of it on video. Offer Nissim has become one of the most requested DJs in the country, and it is easy to see why: he just does not stop all night, and his energy is contagious. I wish I had stayed until Peter Rauhofer started playing to see if the reaction would be the same. I would like to thank the staff at The Week for always being very accommodating. I would also like to thank all the producers who invited me to the parties. I wish I had the energy and the means of covering all the events, but unfortunately I am only one person here doing the work of an entire team. I would also like to congratulate all the Brazilian DJs who played at the parties this weekend. To be completely honest, I danced a lot more while they were playing, and liked the music much better before the international attractions took over. Catch more of the party at The Week, and the trapeze show which took place outdoors on the video below.